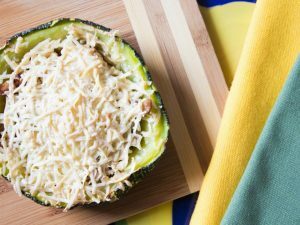 Whether you are looking for a great side dish or a substitute for regular noodles, this simple spaghetti squash recipe is great! Serve this spaghetti squash along with a red tomato sauce, butter and parmesan cheese or with any kind of sauce you would normally pair with wheat noodles. This ‘pasta' dish is a much healthier and nutrient packed dinner than any normal noodle could provide. 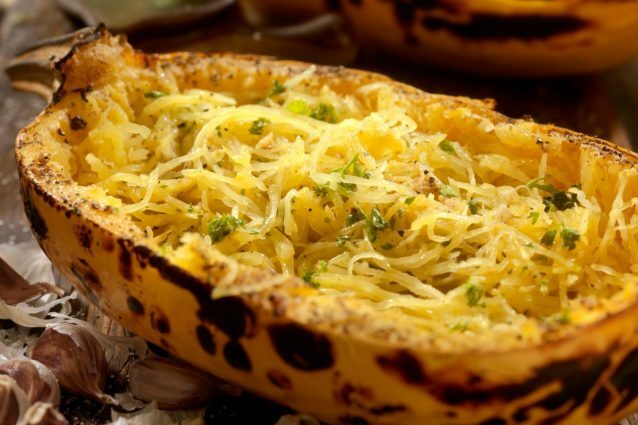 Eat this spaghetti squash hot or cold, it is perfect either way! Place the squash halves in a casserole dish with the center facing upwards. Use a fork to scrape out the squash and separate it into ‘noodles'. Toss with any sauce, vegetables or topping that you'd like and serve hot or cold! -Don't discard the garlic that roasted along with the squash but instead, work it into your recipe. Melted butter and parmesan cheese will go great with the garlic and spaghetti squash and is super easy to make! -If you are using a red sauce on top of this squash, do not add too much or it may weigh down the squash noodles and make them mushy. Add a little bit at a time and try not to over stir.